“For I decided to know nothing among you except Jesus Christ and him crucified” (1 Cor. 2:2). When the Lord allowed Abraham to offer up a ram instead of his son Isaac (Gen. 22:13), He demonstrated to His people that He would accept one life as a substitute for another. Of course, the greatest substitute God has ever provided is His Son, the Lord Jesus Christ, who was offered up to redeem His people two thousand years ago (Rom. 8:32). For the next week, we will base our studies on Dr. R.C. Sproul’s teaching series The Cross of Christ in order to explore the atonement of Jesus Christ — the payment for our sin — in more depth. The English words crux and crucial, both used to describe something essential, are both derived from the Latin word for cross. Without a doubt, the crucifixion, resurrection, and ascension of Jesus are essential to the Christian message. The apostle Paul holds the crucifixion as non-negotiable to the Gospel message in today’s passage. One could argue in fact that the New Testament, indeed, the entire Bible, is concerned only to explain the significance of the cross. Incredibly, the preaching of the cross is often ignored in the church today. Many people are blissfully unaware of their need to be reconciled to a holy God. Like the ancient British monk Pelagius, too many individuals “respect” Jesus but do not believe His death to be absolutely essential to their salvation. Believing in what we may call “justification by death,” many Americans think that all they need to do to stand before God is to die — since everyone will go to heaven. Such people think an atonement is unnecessary. Others view it as only hypothetically necessary. These people say there is nothing intrinsic to God’s character that requires a death to pay for sin; the Lord could have chosen another way to redeem His people. If He had wanted to, for example, He could have overlooked sin. However, in light of Scripture’s view of God’s holiness and sin’s offense, we affirm an atonement is absolutely necessary for salvation. 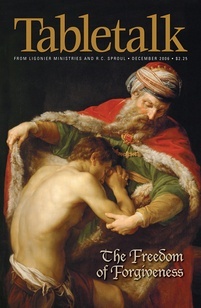 The Father’s wrath toward our sin led to it being condemned in the flesh of His Son Jesus (Rom. 8:3). We will examine this facet of redemption over the next few days. “When I Survey the Wondrous Cross,” a masterful hymn by the Puritan Isaac Watts, includes the line: “Forbid it, Lord, that I should boast, save in the death of Christ my God: all the vain things that charm me most, I sacrifice them to his blood.” With the apostle Paul we should be most concerned to glory in the cross of Christ. Take some time to meditate today on the sufferings of Jesus and consider how the crucifixion reveals God and His glorious mercy.